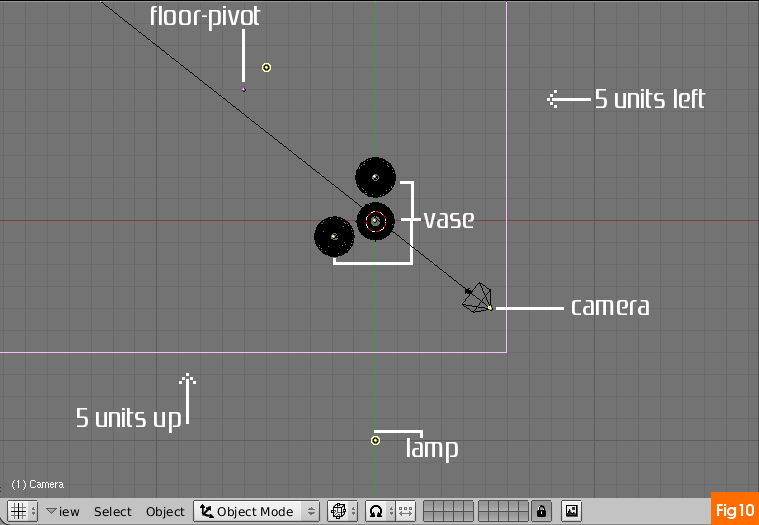 Step-1 By default blender 3dView already have some objects, a cube a lamp and a camera, you can press [F12] to see the default scene rendered. We don’t need the cube, it is already selected(pink) so go ahead and press [Delete], confirm deletion in the pop-up. To make the vase we will use ‘circle primitive’. 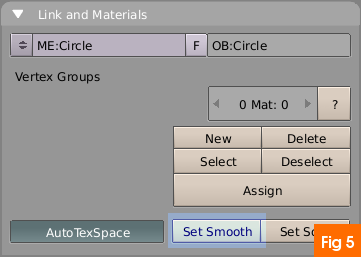 To add a circle press [Space-bar] to bring up the toolbox. In it go to Add>> Mesh>> Circle, confirm the circle of 32 vertices. Step-2 Now we will start editing the circle. You will notice upon adding the circle the circle is in ‘edit-mode’ by default. First we will scale down the circle about 5 major grid units. To do that first press [S](scale) then keep pressed [Ctrl](Constrained movement) and bring the mouse towards the circle pivot, the circle will get scaled down in ‘jumps’. While scaling you can see units or coordinates change in the menu bar. Yes the menu bar gives way to coordinate readings any time you move objects in 3dView. Step-3 We will use extrusion for creating the shape of the vase. Press [Numpad1] to get into front view. Keep all the vertices selected(yellow, [A] to toggle), now press [E](extrusion) select ‘Region’ from pop-up and start moving the mouse upwards(Y axis). Just like the major grid jumps you can get smaller ones by complementing [Ctrl] with [Shift]. Now move it up to 1 small grid unit. Tip: One small unit = .1000 in blender units or coordinates and one major([Ctrl]) is 1.000. Step-4 Now we will enable Subsurf on our vase mesh. Press [F9] (Edit buttons), immediately you will see the buttons-window will change in options. 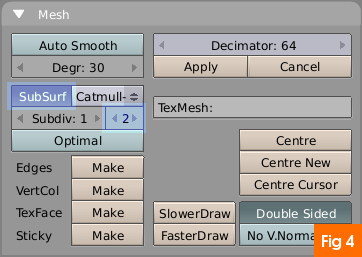 Now in the buttons-window go to ‘Mesh’ panel and press Subsurf button to enable Sub-Surface. SubSurf increases the virtual count of the vertices, edges or faces in order to achieve smoother angles on the surface faces. Increase the value of ‘Subdiv’ to 2 on second spinner button. Step-5 We also need to enable smoothing for the surface itself. In the same buttons-window go to ‘Link & Materials’ panel. Press ‘Set Smooth’ button. Press [Z](3dView Shading) once to get ‘solid shading’ in 3dView. 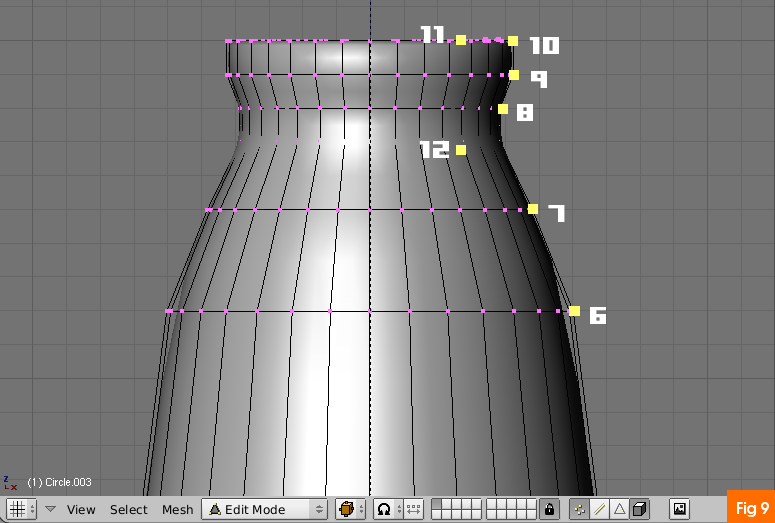 The extruded circle or vase mesh will be shown in shaded mode. Tip: For free form view in the 3dView, press and keep MMB while moving the mouse. Step-6 In the shaded-mode if you see any artifacts on the surface then, first select all the vertices by pressing [A] then press [Ctrl+N] to recalculate surface normals. Before proceeding get back to wireframe view([Z] again). You can now save your work. Step-7 I am assuming that you haven’t changed the front view [Numpad1] and 3dView is in wireframe shading. If you had to go through the step5 then first unselected all the vertices by again pressing [A]. Press [B](box selection) the cursor will change to plus, drag and create a box around the topmost vertices in order to select them. 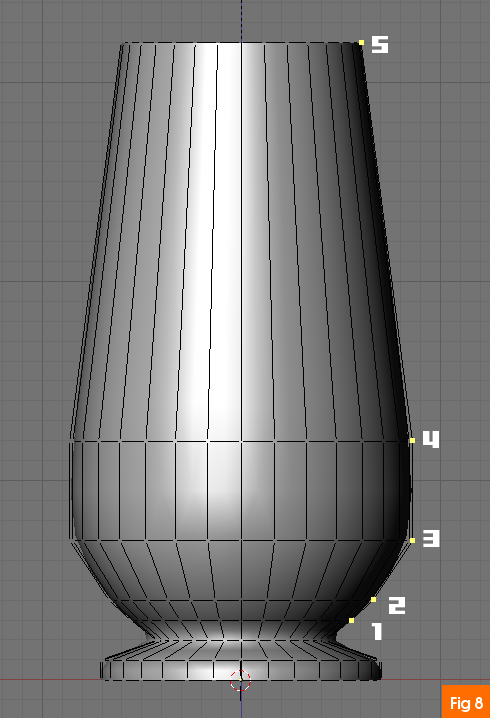 Once selected we can proceed to extrude the vase surface. Press [E] then [Y](Y axis) to constrain movement vertically, now move it .1000 unit upwards. Scale it down to .600. To scale the selection press [S] then move the mouse, click to commit scaling. Step-8 No we have to complete the vase by 13 more extrusions. I am providing the extruding and scaling measurement for each step along with directions. Follow the method of extrusion and/or scaling procedure on them. Make sure you check the coordinates in the coordinate panel on the menu bar when you are moving the vertices. 1) .1000 extrude up, scale 1.300. 2) .1000 extrude up, scale 1.200. 3) .3000 extrude up, scale 1.300. 5) extrude and move up 2 big units([Ctrl]) and then .700 scale inwards. The image8 shows the result of first set of extrusions for our vase model. Step-9 Up to now we had created the bulk of the vase and we can see the process in the shaded view, by pressing [Z]. Before proceeding get back in wireframe view. 6) .2000 extrude upwards, scale .800 inwards. Next two extrusions will shape the ‘neck’ of the vase. 7) .2000 extrude upwards, scale .600 inwards. 9) .1000 extrude upwards, 1.400 scale outwards. Before proceeding get out of edit-mode by pressing [Tab]. Step-10 If you followed right your work will look something like in the image-9. We will now add a floor underneath the vase. Go to top-view [Numpad7]. Press Space bar goto Add>>Mesh>>Plane. Scale it up to 12 big units. Move the plane left 5 major units and up 5 major units. The modeling work for our scene is complete and you can view your work in rendering. Step-11 Now we need to adjust the camera. Select it by right-click. Press [Numpad0] to get into camera view. Grab [G] camera,keep pressed the [Ctrl] and move the mouse downwards one time, the value in the coordinated should Dz 1.0000. This will bring the vase in full view of the camera. Press [F12] to see the your modeled vase get rendered.